Don’t sleep in your suit Beefy! PJ’s surely? As usual Sky Sports provided live coverage of yet another major sporting event. This time it was the India v England Test Match that started in Ahmedabad this week. Unusually however, Sky Sports did not have any commentators at the ground. The Indian Cricket Board had apparently sought extra payments to accommodate the television staff at each stadium – and Sky refused to pay. This meant that the likes of David Gower and Sir Ian Botham had to conduct the commentary in the early hours of the morning from a West London studio. Any pj’s on display?? Overall the commentary team did well but several people have observed that they were wearing their suits and ties at 3am, 4am and 5am. They should undoubtedly re-think their night time wardrobe. We would have loved to have seen them, hot chocolate in hand, wearing their pj’s! Viewing numbers would surely have been higher if cricket followers knew they would have caught a glimpse of Messrs Gower and Botham in their PJs, slippers and dressing gowns? At PJ Pan all of our nightwear lines are named after pyjama related activities, such as Breakfast in Bed, Midnight Feast and Forty Winks. 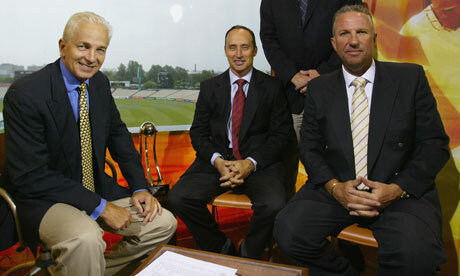 We are now wondering if we should launch a new line, ‘Cricket Commentary’! So if the Sky Production team read this, please get in touch. We will happily provide the PJ’s for the over-suited commentary team! For now the Sky Sports cricket pundits will have to make do with the likes of Night Owl, Early Bird, Running Late ant Sleepyhead which comprise part of our extensive nightwear collection.